There seems to have been an upsurge in people operating WSPR recently. Barely a day goes by (sometimes barely an hour) without someone posting a map of where their signals have been received on Twitter. When I first started experimenting with WSPR and QRSS some years ago, I did exactly the same. 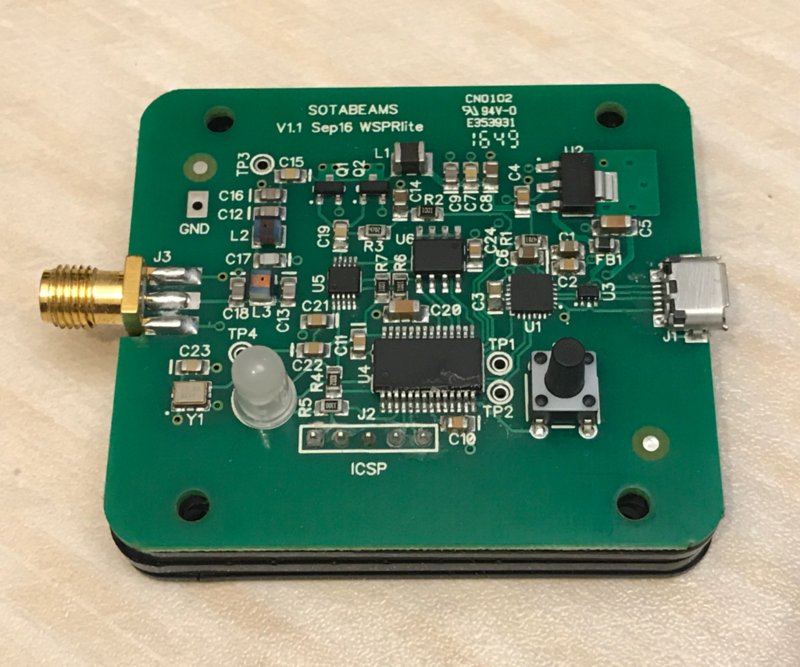 I’m quite sure that this increased interest in WSPR is largely down to a product which was released in late 2016, the “WSPRlite Antenna Performance Analysis System” from SOTAbeams. Over the years, I’ve used three different methods of transmitting WSPR, I’m going to describe all of them, starting with the aforementioned WSPRlite. The WSPRlite is a very simple to use unit, measuring roughly 55x50x17mm (excluding screws and connectors), all you do is plug a micro USB cable in one end, an aerial in the other and push the single button on top to start the transmission. It has a built in real-time clock which will keep it running accurately for up to 30 days without any further intervention. At the end of that thirty days, you have to push the button again. The WSPRlite is configured by a simple piece of software which will work on any version of Windows from XP onwards (XP isn’t officially supported but it works). A version for OS X is available from the WSPRlite Facebook group. Here you can see the WSPRlite configuration utility running on Mac OS X. My WSPRlite is configured on 20m, running 50mW with a 20% chance of transmitting and configured to run for up to 30 days without any further intervention from me. Output power can be configured at 5mW, 10mW, 20mW, 50mW, 100mW or 200mW and each unit is calibrated to be +/- 0.3dB of the selected level. The software will automatically pick a random frequency on the band you’ve chosen. It has a built in low pass filter which is good for 14MHz but if you’re going to operate on any band below that, it is strongly recommended you add an additional filter. You can’t operate on any band above 20m using the WSPRlite. 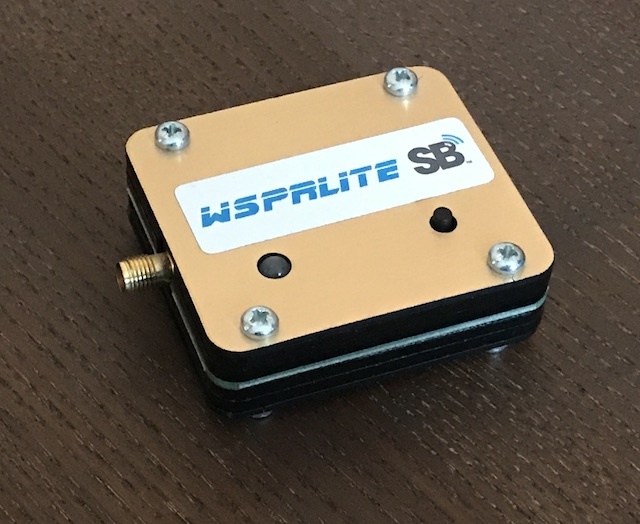 The WSPRlite itself is a nicely produced unit which looks surprisingly good. It’s small, it’s light and it’s easy to handle. It’s very portable so you can quite easily take it out and about with you. Just remember that if your locator square changes, you’ll need a computer to reconfigure it. Not many amateur radio aerials are fitted with an SMA connector though so you’ll need an adaptor to plug your aerial in. Of course, I couldn’t have one of these in my hands without wanting to have a look inside. With no idea whether or not it would invalidate my warranty, I opened it up. The nuts on the bottom are all nyloc style to prevent them from rattling their way off so they were tight to open. I’ve opened mine so you don’t have to! What you’ve got here is a very professional unit. The construction quality is excellent. You can click the image above for a full sized version. This is supplied in kit form and therefore requires construction. As far as kits goes, it’s not complicated and the basic unit can be built in an afternoon. When you order it, you specify one low pass filter for the band you want to transmit on. Additional filters are available and there is also an option for an additional relay board so you can program the unit to switch bands and aerials automatically. Whereas the WSPRlite requires a computer to configure it, the U3S is completely controlled via a fairly complicated menu system. It has a backlit LCD screen and all the options are configured using a pair of buttons to step through and select/configure. Once you’ve done it a couple of times, it becomes second nature. For frequency stability and clock accuracy, the U3S has a GPS input so once it’s set, you can leave it running forever. It will run through a calibration cycle at regular intervals to keep everything accurate. 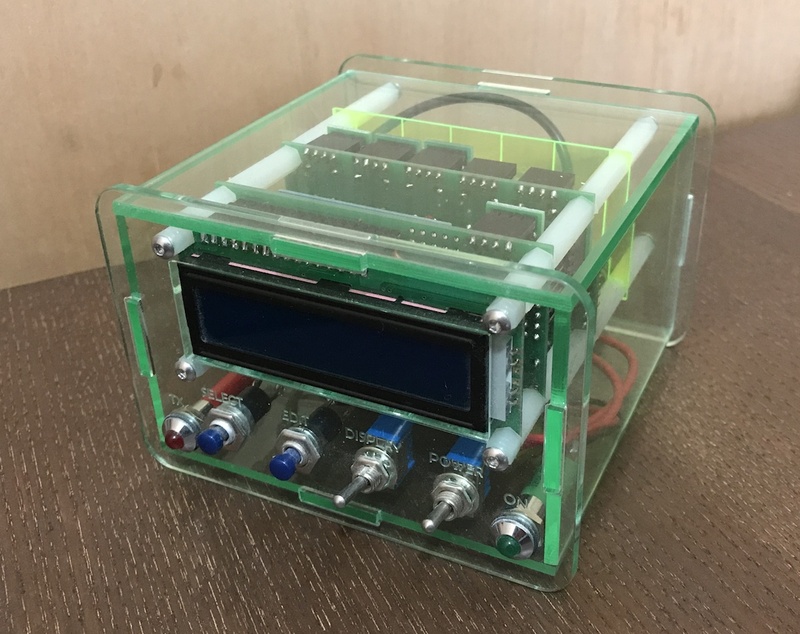 With the OCXO version, frequency control is incredibly accurate and Hans sells a couple of different versions of this kit, one as a VFO/Signal generator and one as a programmable crystal replacement. The GPS also provides location details so if you want to use this portable, there is no reconfiguration to do, it will detect your new location automatically. The U3S will do a lot more than just WSPR. It supports many other low power, low signal modes and I encourage anyone who has one of these to look into QRSS and consider configuring their transmitter to run QRSS as well as WSPR. Output power on the U3S isn’t configurable via the menu but it is possible to set up a separate power supply to the output stage and configure the power that way. This is what I’ve done, I have two voltage regulators in the case, one supplies 5v to the U3S and the other powers the output stage with a slightly higher voltage. 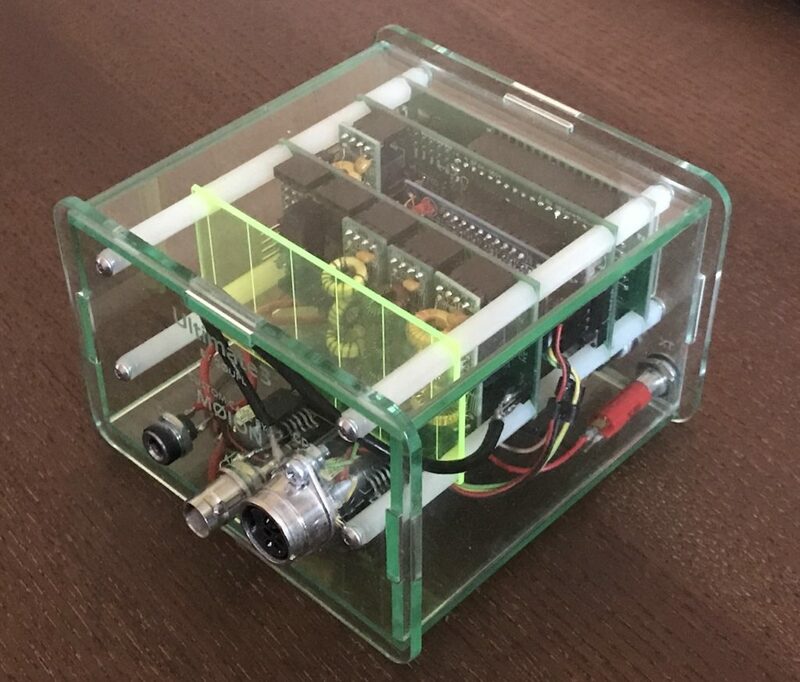 Here you can see one of my Ultimate 3S built into a custom perspex box complete with relay switch board. I have a couple of these transmitters, one has been continually running on 10m since early April. The U3S will transmit on all amateur HF bands and higher. The final method of transmitting WSPR is using your existing computer and transceiver, it’s the WSJT-X package from Joe Taylor, K1JT and is currently on version 1.8.0-rc1. This software handles multiple different modes including JT65, JT9 and the new FT8 as well as WSPR. You connect your radio to your computer using whatever method you like and if you employ full CAT control, you can configure the software to automatically switch bands at different times of the day. For example you could switch to the lower bands overnight when you expect there to be more DX and the higher bands during the day when 80m and 40m are closed to any DX. This is a very nice feature, not currently implemented on either of the other devices (although I understand something similar will be added to the U3S). The software is very easy to use and as long as you leave your computer on, you can have WSPR pickling away in the background all the time. One thing to be aware of is to ensure that the time is configured very accurately on your computer. If it’s more than a couple of seconds out, nobody will decode your WSPR transmissions and you won’t receive anyone. Output power is controlled by your transceiver. Many modern transmitters won’t go below 5W which is really far too much for WSPR but that’s easily resolved either by winding down the output audio from the software or injecting an ALC voltage into the back of the wireless to limit the output power. See your transceiver operating instructions for details on how to do this. 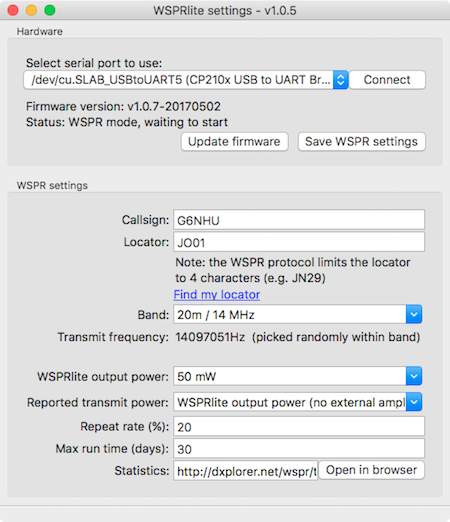 Out of all three methods listed here, running software on your computer is the only way to receive WSPR as well as transmit. Without stations receiving WSPR transmissions, the mode would be utterly useless. You can see here (click the image for a full size version) that even though conditions aren’t great, I’m starting to receive some north American stations as well as Europeans. People say that they run WSPR to see if the bands are open. I think this is a bit of a false reason really with a few exceptions. Most amateur radio stations are capable of transmitting a signal which under the right conditions, will go around the world. By its very nature, WSPR creates those conditions. WSPR is carefully crafted to be received when signals are very weak, down to nearly 30dB below the noise level and there are receivers dotted around the world specifically looking for those really weak signals. Stick a few hundred milliwatts up an aerial running WSPR and someone, somewhere is going to hear it. Increase that power to the base level of a modern transceiver (5W) and it would be very disappointing if that transmission didn’t travel many thousands of miles at some point during the day. Just because a WSPR signal can be received in VK land on 20m, it doesn’t mean that you can fire up your wireless, slap 100W up the same aerial and work all the Bruces! However there are some exceptions to this. A good example is 10m and Sporadic E. I mentioned earlier that I’ve had one of my U3S transmitters running on 10m since early April. Most of the time I get very few WSPR spots but as soon as Es starts appearing on 10m, that number of spots increases massively. When that happens, it’s a really good indication that the band is opening and I’ve seen for myself time and time again that shortly after the spots went up, stations started appearing on 10m SSB. Another reason for WSPR is for “aerial testing”. My comments above apply to this as well. WSPR by nature is designed to receive weak signals. You could hang a bit of metaphorical damp string out the window and throw WSPR up it – It will be received somewhere so this doesn’t really prove anything. Again though, there are exceptions to this. If you have two aerials and two WSPR transmitters running at the same time then you can look at the signals received for the two transmissions and see how the aerials compare against each other. This is a very good use for WSPR, one which I sadly haven’t used yet because although I have multiple WSPR transmitters, they’re not all running the same power so the results would be skewed. Another good reason to run WSPR is that it’s actually quite a lot of fun! Transmitting low power and seeing it be received around the world. It gives you a nice warm and tingly feeling inside to see your 200mW on 40m being received in ZL. What’s not to enjoy about that? If the above reads as though I’m knocking WSPR and don’t appreciate it, it’s not meant that way. I’ve tried to be factual as much as possible. I really enjoy transmitting WSPR and seeing the dots appear on the map. It’s not a QSO mode. Don’t set up a WSPR transmitter, see via the internet that your signal has been received in an exotic country and write it in your log book as a QSO. Worse, don’t post a QSL card to the station who heard you. It’s not a QSO, don’t treat it as such. Yes, I’ve had QSL cards in the post for WSPR spots. They’ve all been ripped up and chucked in the bin. What’s best, WSPRlite, Ultimate 3S or WSJT-X? None of them are ‘best’, they all serve different purposes. If you want a basic self contained unit you can unbox and put on air with practically no effort, get a WSPRlite. If you want a unit you can build, experiment with, play with different modes, expand, adjust and learn, get a U3S. If you want to be able to transmit and receive WSPR, band hop, work other data modes etc, use WSJT-X. I use all three methods on a regular basis. If I want to run a quick WSPR session, I’ll fire up the WSPRlite, if I want to squirt some QRSS, Slow Hell, JT9, CW in a ten minute frame, I’ll use my U3S. If I fancy receiving some WSPR as well as transmitting it, I’ll kick the software into life. Where are these all available from and how much do they cost? The Hans Summers Ultimate 3S is sold by QRP Labs. The base transmitter with one low pass filter including shipping to the UK is $38 (just under £30 at time of writing). There are many options available such as the relay board, case, additional filters, etc. They also sell a deluxe six band version which comes with many of the options for around £110 (depending on exchange rate). 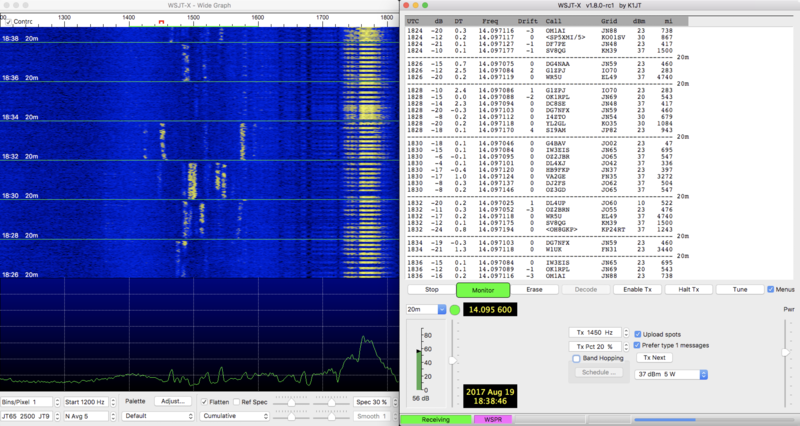 WSJT-X is a free download, you can get it from here. This is not a sponsored review, I have written it independently with no input from SOTAbeams, QRP Labs or K1JT. I have paid full retail price for all the units mentioned in this piece, nothing has been supplied by the manufacturers. This entry was posted in Amateur radio, Construction, Data, HF, WSPR and tagged Hans Summers, Review, SOTAbeams, WSPR, WSPRlite. Bookmark the permalink. Hi Keith, I think it’s worth mentioning that the WSJT-X software will run quite happily on a Raspberry Pi so it’s not necessary to keep the shack PC running just for WSPR (or any of the other modes supported by the software). It also makes for another alternative for going /P. Yes, that’s a very good point. Although I’ve got a bunch of Raspberry Pis here (what’s the collective term for multiple Pis? ), I’ve not tried running WSJT-X on them. It would be difficult to do because I’ve never actually plugged a monitor, mouse and keyboard into any of them though. Perhaps I could experiment with running some kind of remote desktop to one of them and experiment with that. I assume that a Pi3 is needed? First of all I enjoyed the well written article and summary of the different methods of WSPR operating. As you might know Keith, I’m also a WSPR (and QRSS) enthousiast. I want to mention that it is easily possible to setup a WSPR receive station, using a Raspberry Pi (a Pi 2 in my case), using the WSJT-X software (v1.7 and v1.8 running flawlessly). Together with a small SDR rx, it can monitor WSPR 24/7, and even does it with bandhopping. I do know it is possible to transmit WSPR with a Raspberry Pi using the GPIO pins, but haven’t done any tests with that yet. This setup I’m using is headless, no keyboard nor monitor is plugged in, so all remotely controlled. That’s interesting – So it’ll work on a Pi2. I have a spare Zero W sitting here so I’ve managed to install WSJT-X on it. I’ve even managed to get RDP working so I can see the desktop! When I run WSJT-X through the Applications menu, nothing happens. If I try and run it through the terminal I get a single response “Illegal instruction” and then nothing happens. I really don’t know where to go from here. I do appreciate that it’s not going to work well on a Zero, this is just to try proof of concept. Any suggestions as to where I should be looking to fix this? As you just mentioned, a Pi Zero is a bit on the light side I guess. But as it wont start in the menu, the 512MB memory of the Zero is not sufficient. It was just a trial to see if it worked on a Zero – I’ll pick up another RPi3 and give that a try. Then the difference in TX power can be seen on an aerial, and the difference in aerial radiation effectiveness for a TX.